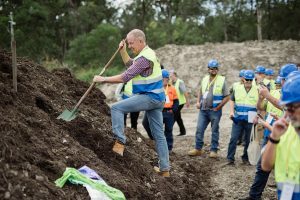 AORA Demonstration Day Proves ABA Certified Compostable Materials Meet Australian Composting Requirements. The Australasian Bioplastics Association (ABA) and its Members participated at the 2018 Australian Organics Recycling Association (AORA) Annual Conference Demonstration Day Held in Brisbane by putting certified compostable bags and food service ware to the test. Participating ABA members supplied their certified compostable bags and food service ware with the AORA team to establish time required for items to compost under AORA established conditions. ABA member certified compostable bags and food service ware were buried in an open windrow. Windrow composting is the production of compost by piling organic matter in long rows (windrows). The AORA team built a windrow of composting FOGO (Food Organics Green Organics) consisting mostly of green waste removed from normal processes at around two weeks from establishment and at around seven weeks prior to the demonstration. Once built, the windrow was not turned again. The certified compostable items supplied by ABA members were buried in the windrow and staked out at 6/4/2/1 weeks to test decomposition time. At 6/4/2/1 weeks and around 10 days prior to the demonstration the AORA team placed fresh food waste (lettuce and other green leaves) in ABA member certified compostable plastic bags and placed them and some ABA member certified compostable plates, Take-out containers, Clear cups, Paper Coffee Cups and cup lids into holes dug to a depth of around 400-600mm in the windrows. These were re-buried and marked with stakes. The windrow was not otherwise touched. The windrows were temperature tested weekly at 62-65C. 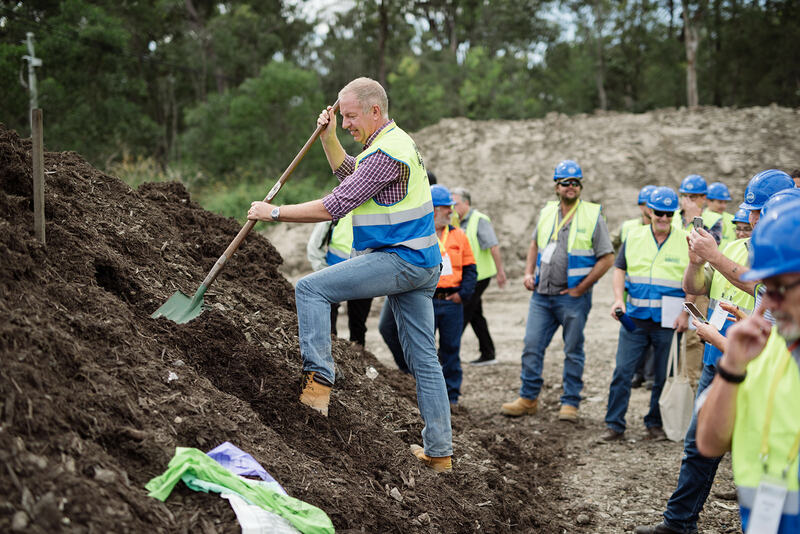 On the AORA Demonstration Day in front of AORA Conference attendees, the AORA team dug up the areas marked with the stakes to check the certified compostable materials state of decomposition. At none of the marked stakes were AORA able to find any evidence of the buried material. The results, of the decomposition trial of ABA member supplied certified compostable material, were conclusive that all the materials buried during the trial period were composted. The rate of decomposition particularly from items buried at the 1/2/4 week stakes demonstrated the speed of decomposition of certified compostable items. Further investigation, by the AORA team, using a Komptech turner and trommels to ensure nothing was missed, again confirmed that all ABA member supplied certified compostable items had composted. 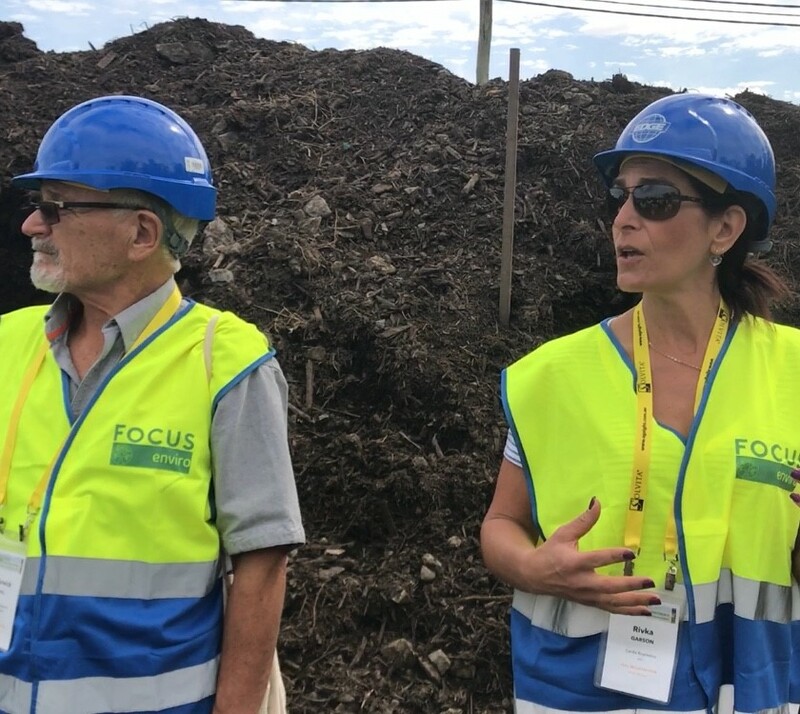 On completion of the test, ABA Executive Warwick Hall and ABA Committee Member Rivka Garson spoke to AORA members on the stringent process that compostable products need to go through to achieve certification and have the ability to carry the seedling or home compostability logo. Hall and Garson, also spoke on the importance of ensuring that only certified compostable bags and products are used for in composting processes and how to easily identify these items, through the seedling logo and home compostability logo as well as the identifying number supplied to each ABA members products. Without the logos and identifying numbers, material is not considered certified compostable. 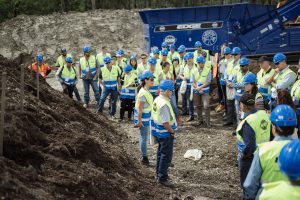 https://www.bioplastics.org.au/wp-content/uploads/2018/07/AORA-Demonstration-Day-Proves-ABA-Certified-Compostable-Materials-Meet-Australian-Composting-Standards.jpg 1941 4491 Robin Tuckerman https://bioplastics.org.au/wp-content/uploads/2015/11/logo_aba1.png Robin Tuckerman2018-07-04 06:50:052018-07-04 06:50:05How Long Does It Take For Certified Compostable Products Take To Compost? The Australasian Bioplastics Association (ABA) welcomes and applauds the announcement from Federal Energy and Environment Minister Josh Frydenberg that by 2025, 100 per cent of Australian packaging to be recyclable, compostable or reusable. Minister Frydenberg has been pushing the plan to ensure packaging is recyclable, reusable or compostable, which would eliminate much of household rubbish. Commonwealth, state and territory environment ministers have agreed to cut Australia’s supply of waste, increase our recycling capability and increase the demand for recyclable products in response to China’s new restrictions on recyclable waste. Ministers have also brought forward the review of Australia’s National Waste Policy to be completed within a year. This will ensure that governments are taking the most appropriate and timely actions to support a sustainable recycling industry. Australia has an opportunity to develop its capabilities and capacity in recycling through effective cooperation and collaboration among the three levels of government. As the leading industry body for Australian and New Zealand manufacturers, converters and distributors of bioplastic products and materials, the Australasian Bioplastics Association administrators a voluntary verification scheme for compostable bioplastics certification. Australasian Bioplastics Association members are already a major contributor to local councils FOGO (Food Organics Garden Organics) waste diversion programs. Recognising that diverting FOGO from landfill has environmental and commercial benefits, many Australian and New Zealand councils have implemented FOGO diversion programs where FOGO is collected in certified compostable bags and sent to commercial composting facility. Certified compostable bioplastics are made from bio-based material and compost in either industrial compost facilities if certified to Australian Standards 4736-2006 for Industrial Composting or if certified to Australian Standards 5810-2006 for Home Composting. Certification provides compost facilities confidence that compostable bags do not cause contamination. The Australasian Bioplastics Association’s programs are supported by AORA (Australian Organics Recycling Association). For almost every conventional plastic material and application, there is a bioplastic alternative available on the market that has the same properties and offers additional advantages. With Australia’s largest supermarkets taking robust action to phase out single-use plastic bags and states heading to bans on plastic bags used by retail outlets including reducing plastic wrapping on fruit and vegies, certified compostable bags offer a real alternative. Certified compostable labelling assists consumers, recyclers, composters and councils to clearly identify these products and ensure correct waste separation, collection and recovery. The 2025, 100 per cent target will be delivered by the Australian Packaging Covenant Organisation, working with its 950 member companies and partners, including the Australasian Bioplastics Association. According to the Municipal Association of Victoria, a decision by China to place a ban on the import of recycling materials from outside the country has resulted in several councils having their recycling contracts cut back by waste companies. The Chinese town of Giuyu used to be a dumping ground for the world’s trash. Now China has banned imports of foreign waste to crack down on its own chronic pollution problem. If this continues, councils will have to stockpile millions of tonnes of waste or worse, dump it all in landfills. BioPak, which was established in 2006, is the largest manufacturer and distributor of environmentally sustainable disposable food packaging in Australia, which means our products are designed to be repurposed rather than ending up in the local tip. It also means that we are acutely aware of the seriousness of the situation. Let’s be clear: Australia is facing a potential waste crisis – we are running out of landfills, no matter how many more we build. Every year, Australians send more than 6.2 million tonnes of organic waste to landfill, which include everything from food scraps to garden clippings and cardboard boxes. In 2016 alone, Australians sent about 2.2 million tonnes of plastic and about 1.6 million tonnes of paper and cardboard to landfill. The landfill problem is not one limited to Victoria or even Australia – the issue has been troubling policy makers across the world, especially in the United States and Europe. We are well aware of what this means: landfills will eventually fill up, no matter how many we build. So, what can we do? Well, we need to focus on more than recycling, for starters. While continuing to encourage more councils to recycle waste, we believe the time has come to find others ways to deal with this huge landfill problem. In other words, we need to consider alternatives, such as compostable food service packaging, including those ubiquitous coffee cups. It means we need to start talking about a truly circular economy, where we design and produce food service packaging from environmentally friendly, responsibly sourced rapidly renewable materials, such as paper from managed plantations, agricultural by-products such as the stalks of sugar cane after the sugar has been extracted and compostable bioplastics. Then comes the hard bit: to help guide that compostable packaging and remaining food scraps through the economy, from café or restaurant to workplace to green waste bins. Eventually, those green waste bins are processed at commercial composting facilities where their contents are turned into nutrient-rich compost for use at home – or in large-scale commercial agriculture and land rehabilitation. A major benefit of producing compostable, bio-based food packaging is that through commercial composting it can be diverted from landfill along with any remaining food residues at the end of its life. In the process, the methane gas that organics emit when they biodegrade in landfill is eliminated. This is not futuristic thinking by any means. The compostable foodservice packaging is widely available and commercial scale compost infrastructure is growing at a rapid pace to address the huge amounts of organic waste that mostly goes to landfill. European countries including France and England have committed to phase out and ban non compostable foodservice packaging within the next decade. In Britain, where the debate has accelerated in the past year or so, the Ellen MacArthur foundation – a think-tank that works with business, government and academia to build a framework for a circular economy – recently released a report looking into compostable packaging. After three years of investigation, the interim report concluded that compostable packaging provides the only genuine solution to ensure food service packaging, including coffee cups, is diverted from landfill. Here in Australia, BioPak recently signed an agreement with one of the big four banks, which has converted all employee food service outlets in their head office building to collect compostable food packaging. And we have launched a national program to encourage cafes and other venues to put our compostable cups and packaging into special bins, which will be collected and recycled into compost. BioPak is committed to doing the right thing, designing, making and distributing food packaging that is sourced from renewable materials, which means contributing to a sustainable life cycle – rather than packaging that has a single use, before it ends up at the local tip. In a true circular economy, our ultimate objective is zero material going to landfill. It’s an ambitious goal but one that we believe is achievable. All we need if for our politicians and business leaders to start paying attention, not just in Victoria but nationally. Richard Fine is the founder of BioPak. With additional input from Gary Smith, who is BioPak’s chief executive officer. We all love the convenience of easy to buy, easy to use products that fill our supermarkets. Convenience means packaging and that means that there are no escaping plastics in our life. Packaging is the single biggest application of plastic globally with most packaging being disposable, single-use items. Unfortunately, even though recycling exists in many countries, only 2% of recycling globally is turned into new packaging. In addition, with 8 million tonnes of the material enter the ocean each year something has to change. There are now positive signs that both governments and industry are moving towards a circular economy, where the end use of plastics and packaging is considered from the outset. It looks like bioplastics are no longer just of interest to sustainability focused consumers, big brands have started taking note of bioplastics advantages. Forward thinking big brands are taking a lead and are calling for the consumer goods industry to step-up its efforts to tackle the mounting challenge of ocean plastic waste and create a circular economy for plastics. The Ellen MacArthur Foundation announced at the World Economic Forum on January 22nd 2018 a list of 11 big brands working towards using 100 per cent reusable, recyclable or compostable packaging by 2025. Big names including Amcor, Ecover, evian, L’Oréal, Mars, M&S, PepsiCo, the Coca-Cola Company, Unilever, Walmart, and Werner & Mertz, have chosen to lead the way for other brand-owners, retailers and plastics processors to make the consumables market more sustainable. Considering they represent over six million tonnes of plastic packaging annually, these companies can create real impact. With an ever-growing number of big brands turning to bioplastic solutions, the market penetration is well on its way. Brands such as Procter & Gamble, Puma, Samsung, IKEA, Tetra Pak, Heinz, Stella McCartney, Gucci and retail leader Iceland UK have already introduced first large scale products in Europe. There are also other well-known names committing to change, for example, Lego allocated one billion kroner (AUS$162.8 million) to research more sustainable materials. In the automotive market, Ford, Toyota and Mercedes have introduced various bioplastic components in several car models and electronics giant Fujitsu already uses bioplastics in some of its products. Although the impact of all of these big brands making changes will not be immediate, they will start resonating through their supply chain with suppliers and manufacturers needing to look at viable functional alternatives including plant based compostable bioplastics . The next few years will be an exciting time for the bioplastic market and for consumers. Consumers will be able to make informed decisions and choose products and packaging that have a positive impact.